Dan Stuart, voice of long-lost alt-country rockers Green On Red, returned to these shores with an elegantly jaded, world-weary angst as he championed his album ‘The Unfortunate Demise Of Marlowe Billings’. 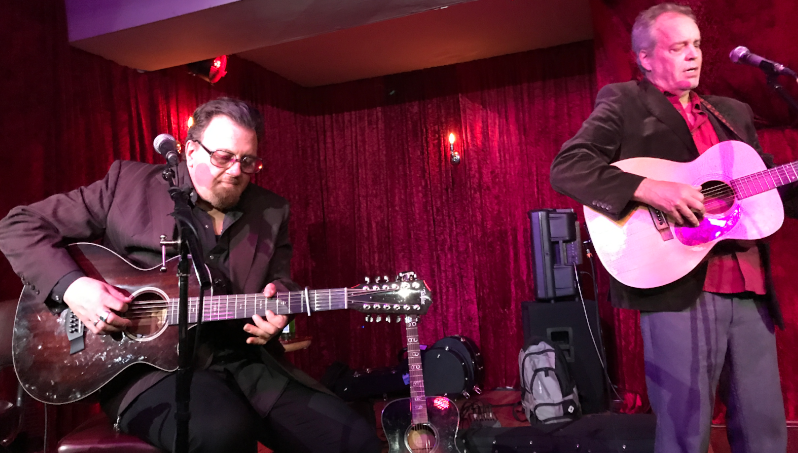 Touring with guitarist (and album sidekick) Tom Heyman, he’s here joined by Long Ryder Sid Griffin for a show that ends up being almost three hours of biting, rootsy Americana. Heyman kicks things of with his own set featuring a lot of elegant fingerpicking, much of it on 12-string. From San Francisco, yet someone who studied in Reading, he throws in pub rock references as he plays numbers such as Out West – a figure described by Stuart as “Kris Kristofferson morphed with Stephen Bruton”. Griffin has made London his home, so much so that he’s wearing a sleeveless pullover, a rarity in roots-rock. Wielding a mandolin (and sometimes his proud possession, a gleaming new Grafton banjo), it’s a finely-crafted set that takes in the likes of Everywhere (a song written with Greg Trooper and covered by Billy Bragg), the Long Ryders’ If I Were A Bramble and You Were A Rose (a duet with wife Rhiannon), all ending in a pumping, stage-striding singalong of The Day The Last Ramone Died, a bluegrass(ish) tribute the New York’s finest. At this point, Stuart and Heyman arrive on stage, a semi-acoustic power trio of guitars and mandolin. Stuart, charmingly unkempt, a man out of his time, wears a brown velvet jacket, another thing you don’t see so much of in country these days. The deadpan delivery and bitter humour belies a craftsman’s touch, years spent living in Mexico or the deserts of Arizona inspiring an ethereal out-on-the-edge sound tinged with echoing Mexican motifs. Much of the set is worked around songs from the new album – the hard rocking Joke’s On Me, the angst of The Day William Holden Died, the chant-like venom of Tucson, the love song turned on its head of Why I Ever Married You and the bleakly beautiful Upon A Father’s Death. In-between, Stuart jokes and jibes, taking on ex-wife, politics and the world in general, someone who was an angry young man, but realises he’s still angry…but not so young anymore. Exquisite runs from both Heyman and Griffin create a soundscape of the big skies of America as the drama plays out, a work of art from three blokes in a pub – albeit a posh one.